Sport is reporting that Coutinho’s colleagues are confident the 26-year-old can improve his poor form, but his performances against Valencia and Real Madrid will be a cause for concern for boss Ernesto Valverde. 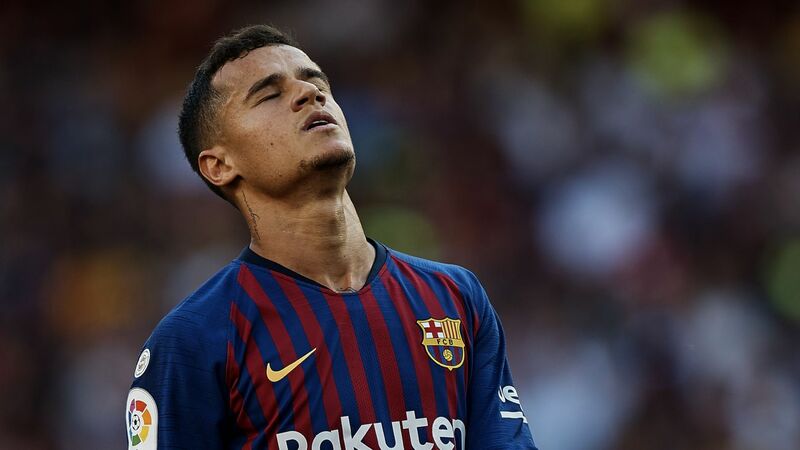 Coutinho has struggled for consistency since his switch to Camp Nou, and it was hoped that his double against Sevilla — when he scored from the penalty spot and then headed a second — would kickstart his season. 21.45 GMT — DONE DEAL: Mexico international Marco Fabian has completed his move from Eintracht Frankfurt to Philadelphia Union. The 32-year-old defender has made over 300 appearances in all competitions for the Rossoneri and, along with Ibrahimovic, was part of the club’s 2010-11 title-winning campaign. 19.48 GMT: Marek Hamsik‘s on-off move from Napoli to Dalian Yifang apperas to be on again, with Sportmediaset reporting that the 31-year-old has undergone a medical in Madrid ahead of his move to the Chinese club. 17.55 GMT: Rumours linking N’Golo Kante and Paris Saint-Germain are not new, but the latest suggests the French champions will once again seek to sign the World Cup winner in the summer. And PSG have a need for a defensive midfielder, having missed out on signing Everton’s Idrissa Gueye in January. 17.10 GMT — DONE DEAL: Former Fulham and Brighton goalkeeper David Stockdale has joined Coventry from Birmingham on an emergency loan deal. However, owner Abdallah Lemsagam moved to appoint a full time manager and will turn to Oldham-born Scholes on a full-time basis — his first game in charge will be Yeovil at home next Tuesday with Wild likely to be caretaker-manager for Saturday’s clash at Crawley. 14.27 GMT: Jadon Sancho has told ESPN FC that he was inspired to leave Manchester City and join Borussia Dortmund following Christian Pulisic‘s success at the club. 14.00 GMT: ICYMI: Real Madrid and Manchester United are tracking Benfica attacking midfielder Joao Felix, who has been labelled the “new Cristiano Ronaldo,” a source has confirmed to ESPN FC. Yes, we know they can’t sign anyone until the summer but Mundo Deportivo reckon that’s exactly when they will make their move for Benfica’s 23-year-old Alex Grimaldo, a product of Barcelona’s La Masia youth academy. The problem being that Manchester City are also after a new left-back and we know who will win that bidding war. The club’s annual accounts for the financial year to May 31, 2018 showed pre-tax profits grew by more than 300 percent from £40m, eclipsing the £92.5m made by Leicester City in 2016-17. 12.52 GMT: Nicolas Pepe is “just behind” Neymar and Kylian Mbappe on the list of Ligue 1’s top strikers, according to the Lille president, but he could very soon be judged against his Bundesliga peers. 11.44 GMT: Ajax’s Barcelona-bound wonderkid Frenkie de Jong has revealed that the decision to choose between PSG and Barcelona wasn’t actually that difficult after all. According to the publication, the Spaniard underwent a medical on Wednesday before signing a contract with Los Che. Ruiz, who began his playing career in Valencia’s youth teams, is tied to Segunda Division side Mallorca until the summer. The 23-year-old has made 11 league starts this season. 11.01 GMT: French-born Morocco international Medhi Benatia says he left Juventus for Qatar for “personal reasons,” stating he wants his children raised in a Muslim country. He “will play for Bayern Munich by July 1, 2020 at the latest. The decision when he will leave Hamburg SV will be taken by Fiete Arp alone,” the German champions said. 09.38 GMT: Real Madrid playmaker Isco says he is not “enjoying the same opportunities as his teammates” in an apparent criticism of coach Santi Solari on social media. 09.00 GMT: Cesc Fabregas believes that Chelsea forward Eden Hazard will continue at Stamford Bridge, though he admits he knows his former teammate “likes Madrid.” Hazard — whose contract at Chelsea runs until June 2020 — said this week he had “made a decision” regarding his long-term future amid continued speculation linking him with a move to Real Madrid. Fabregas, who left Stamford Bridge after four-and-a-half years to sign for Monaco in the winter transfer window, told Spanish radio station Cadena Ser: “If he [Hazard] said that [he had made a decision], I think he will renew his contract with Chelsea. He will never fight with Chelsea to leave. It’s his great club and he has won everything in England. It’s hard not to interpret that as a blunt criticism of Solari from Isco. It’s seems ever more likely that one (or perhaps) both of them will not be at the Bernabeu next season. Glasgow Rangers are keen to make loan star Ryan Kent‘s move from Liverpool a permanent one in the summer, reports BT Sport.